This is more of a reminder but the deadline for registration for the NCGA /USDA Gin School in Stoneville, MS is nearing. The National Cotton Ginners Association and USDA jointly coordinate three gin schools each year. The experts in various fields are gathered to teach three levels and continuing education courses at the various schools. Although the Curriculum is substantially the same, the instructors are excellent at tailoring the instruction to the three main variations in ginning across the country. The Western School is geared toward roller gin ning, the Southwest School has a bit of a stripper harvested focus and the Stoneville School is primarily upland cotton oriented. While the Western and Southwestern Schools are past, there is still the opportunity to attend the Stoneville school this year. If you’re a Certified Ginner, this is a great opportunity to expand your education with the Continuing Education classes. 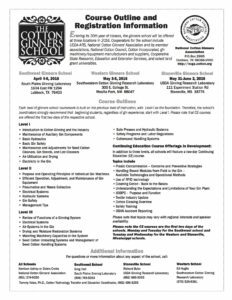 Please take a few minutes to review the linked flyer and sign up for one of the three levels or Continuing Ed class at this year’s Stoneville Gin School. The cutoff for registration is May 20th. If you need more information, please go to the NCGA Website.